Whenever possible, for performance and flexibility reasons, Share link is the preferred method of sharing your albums and photos. 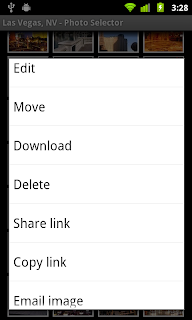 The new sharing features are available for your own albums and photos, the ones of your contacts' as well as for any public photos displayed in the Search section of the Social menu. For more details regarding the new sharing features, please refer to the screenshots below. We also included multi-select delete for web photos in this release. Many thanks to the users who suggested these features and a Happy New Year to everyone! We've just published a new version of Picasa Mobile, 2.7.4, that includes multi-select delete for local media files (photos and videos). It also includes support for large local video playback (over 100MB). Please note the Google Picasa API does not allow uploading videos larger then 100MB. By default, only the favorite (starred) contacts are shown. You can show all contacts by choosing Filter / All from the context menu. We hope you'll find these new enhancements useful. 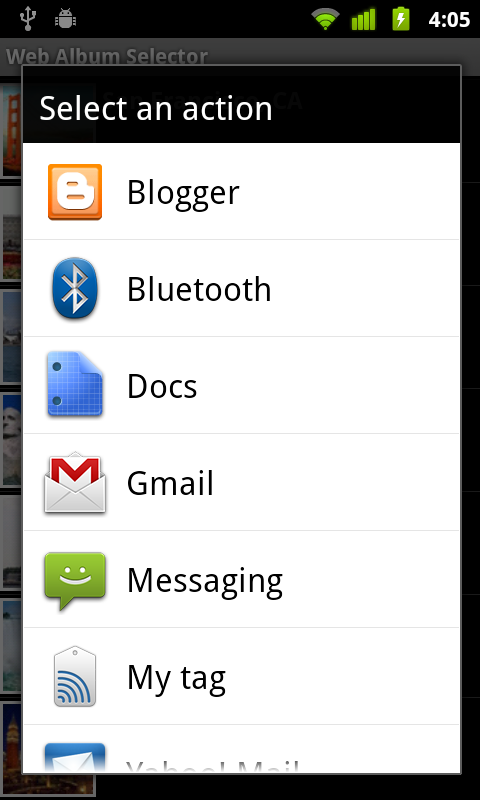 Starting with version 2.5.0, Picasa Mobile's main menu has a new look. The new design replaces the old list view with a grid-based interface that facilitates identifying and selecting the right menu item. Although the old menu was looking reasonably well on a phone, it was not the best choice for a tablet. The new layout adapts itself depending on the device's resolution, as well as and the current orientation. Many thanks to Dan and Matth for suggesting this change! 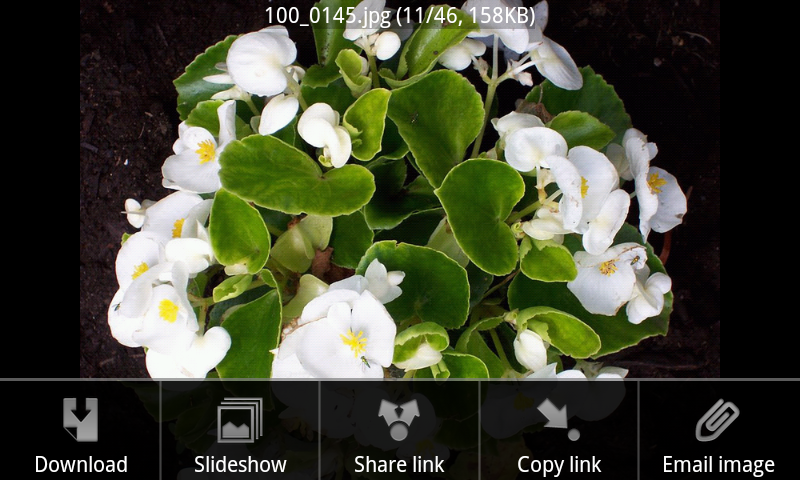 We released today a new version of Picasa Mobile (2.4.0) that includes a very often requested feature: pinch-zoom. For best zooming results, please make sure the highest photo resolution is selected in Settings/Photo Browsing. While in zoom mode, you can also pan the image by dragging it. Many thanks to John, Lester, David, Ernst and Tzinzo for suggesting it. We just released a new version of Picasa Mobile, 2.3.3, that allows users to move web photos to a different album than the one they currently reside in. 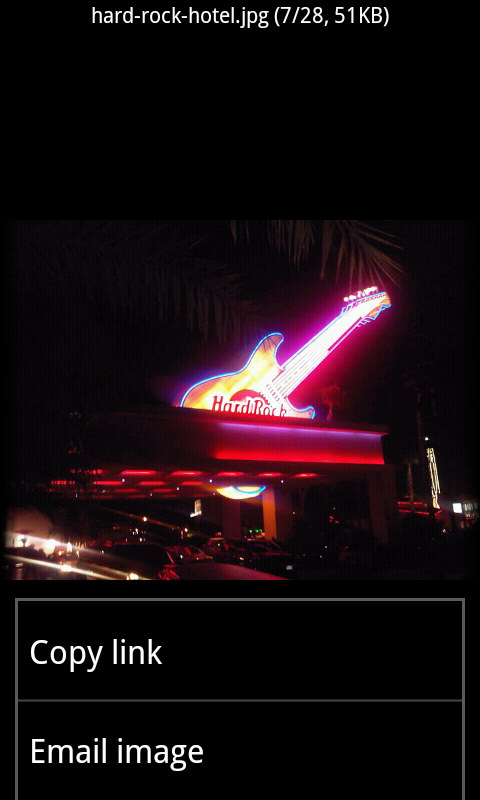 To use this feature, in the Web Photo Selector, tap the Menu key. From the options menu that appears, choose "Move". Tap the thumbnails of the photos you want to move to select them. 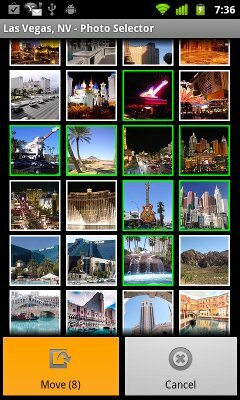 The selected photos are displayed with a green border. To unselect a selected photo, tap once again on its thumbnail. The "Move" button shows you the number of selected photos (8, in this example). Make sure all the photos you want to upload are selected, then tap on the "Move" button. You will be prompted to select the target album. Select the desired album from the list and you're done! Alternatively, the photos can be moved one by one by long-pressing on the thumbnail, then choosing "Move" from the context menu that appears. Many thanks to Bob for requesting this feature and patiently waiting for it to be implemented, while supporting me with his kind emails! 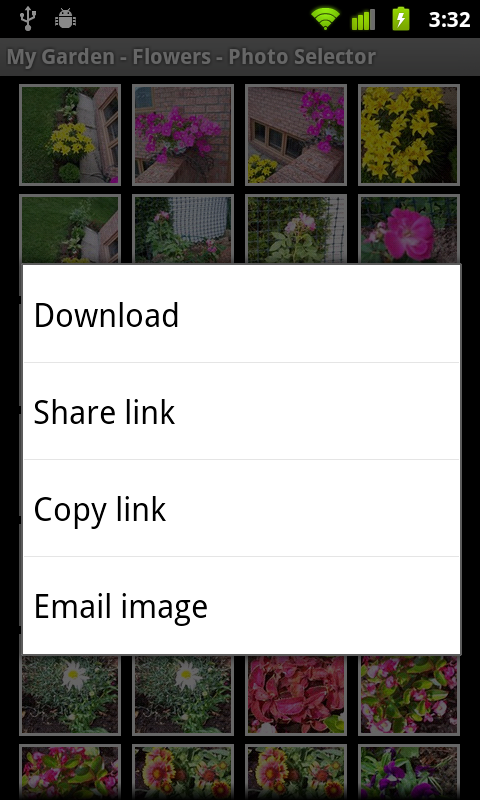 This new release adds multi-select download for your and your contacts' photos. Many thanks to Jim for suggesting it. Many thanks to John, Tzinzo and Harald for suggesting some of the above enhancements! Picasa Mobile 2.0 Is Now Live! 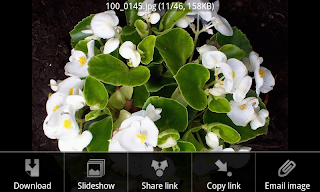 As mentioned in an earlier post, a major release of Picasa Mobile for Android is now available for download from the Google Android Market. Stay tuned for more highlights and new features! As usual, all the updates are free, always! Update: The issue has been fixed by Google. Yes, we were thinking big and we named it Picasa Mobile, but so far, it only runs on Android phones and tablets. While the Android SDK and its tools make mobile development a breeze, the same cannot be said about other platforms. Here's why. Developing apps for iPhone makes sense from a market share standpoint. The iPhone's market share is estimated at about 30% (slightly below Android's) and it would make business sense developing for its platform. However, developing for iPhone is highly restrictive. First off, you absolutely have to develop on an Apple device. Since a Mac laptop sells for about 1,200 CAD, this begs the question: do I really want to spend that kind of money to develop 99 cent apps? Secondly, publishing on Apple's App Store seems quite painful. The apps are subject to a review process and only the approved apps make it to the App Store. And when it's finally published, if a user asks for a refund, Apple gets to keep its 30% and the developer has to refund the whole cost out of her pocket. In terms of coding, Objective-C (the development language for iOS and most things Apple), although arguably faster, seems somewhat antiquated (think header files) and uses non-mainstream development paradigms (ex. : messages instead of method calls). In my opinion, Java seems a lot more natural, intuitive and productive. The transition from Android to Blackberry development seems less steep, since both of them are Java-based. Also, with RIM (the creator of Blackberry) being a Canadian company, it gives us even more incentive to try it out. This presents a big challenge for us, since all our development is done on Ubuntu. The PlayBook development seems a bit more accessible and it is available for Linux; however its market share has to pick up and RIM has to fix some of the problems with its tablet before it becomes really interesting for developers. On the bright side, RIM has gotten the message that it cannot survive without a thriving development community. Although it may be a bit late for the existing Blackberry devices, the new direction seems to favor Adobe's Air platform for app development - in my opinion, a very good step forward. Rumor has it that they also intend to support Android apps, which kind of begs the question: why build a different OS to run Android apps, when you can use the Android OS? At this time, we find developing for Windows Phone very unlikely. As mentioned before, all our development is done on Ubuntu. Moreover, Windows Phone's market share and prospects are quite dim and we don't like betting on a loosing horse. But, while we're on the subject, I can't stop wondering, what was in Nokia executives' heads when they forged an alliance with Microsoft? I understand that their Symbian OS had become quite outdated, but they could easily have adopted the Android platform without any strings attached. For the foreseeable future, I think we'll stick with the Android framework. Although not perfect, it is, in our opinion, the best mobile framework available. At long last, on May 1st 2011, we released our first Android application dubbed Picasa Mobile. It can be downloaded from the Android Market and more details, including a comprehensive online help can be accessed on the Imprologic's main site. We felt there was a need on the market for such an application. The built-in Gallery app doesn't offer a lot of features in terms of interacting with Picasa while other similar applications seemed kind of incomplete or presented security concerns. The intention was to allow the user to easily browse through her Picasa web albums, manage them and upload new photos, even directly from the camera. We are really proud of this last feature since no other Android app on the market seems to offer it. As the cherry on the cake, Picasa Mobile also uploads your current coordinates along with your pictures when you use its Camera option. We also believe that the best place for your photos is on the web, you can easily share them with your friends and you can never loose them. Your phone may break or get stolen, you don't want to loose your precious vacation or family pictures if that happens. Bottom line, at any given moment, storing your photos online is the safest alternative. Direct camera upload including GPS coordinates - it will upload your photos the moment you take them. 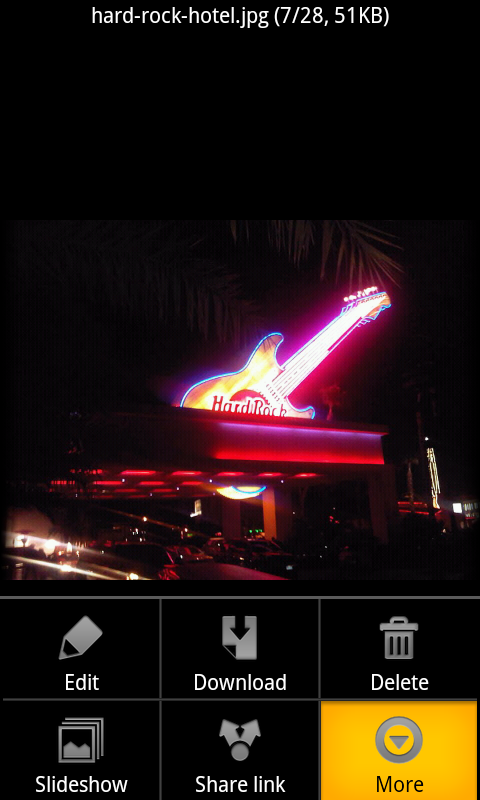 The photos will appear in your default Picasa album and they will include the location where you were at the time. Fast Picasa album and photo browsing - you can use this app as a virtual wallet photo, you can show your Picasa albums to friends and brag about the places you visited. 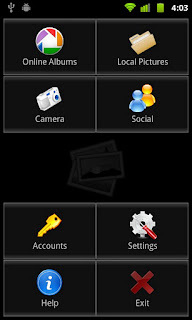 Manage your Picasa albums: create new albums or update existing ones. 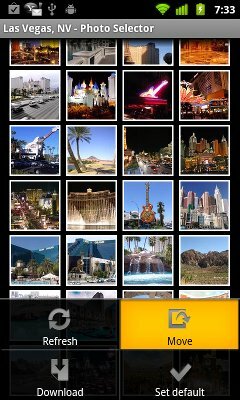 Local photo browsing and upload: review the pictures on your phone's SD card and upload them to the album of your choice. Multiple accounts: you can easily switch between all your Picasa accounts. Starting with version 1.0.5, you can choose to use your phone's built-in Google account(s). Secure connections: all the communication with Google Picasa is over https. Free and continuous software updates: we will be releasing new features often, based on user feedback. And because a picture is worth a thousand words, you may also want to see some Picasa Mobile screenshots, or a video demo of the app.